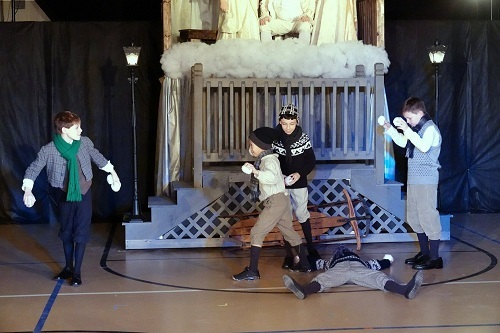 Young George Bailey (Ilya Jonas) and friends have a good old-fashioned snowball fight in “It’s a Wonderful Life,” now playing at Twin Beach Players. Photo courtesy of Twin Beach Players. The holiday season is fast upon us and, of course, all of the old favorites are running on TV. Sometimes, though, it is really nice to go and see a new take on an old classic. The Twin Beach Players is putting on the familiar story of “It’s a Wonderful Life,” but has added a few new twists. Best of all, each of the twists has just sought to further emphasize the timeless message of the show. Adapted by Doug Rand and directed by Rachel Cruz, Twin Beach Player’s production of “It’s a Wonderful Life” boasts a cast of over 60 members and a crew of at least 10 more. Truth be told, I lost count as new faces graced the stage throughout the performance. At least two-thirds of the cast and most of the crew is made up of children, which is wonderful. I am amazed by director Rachel Cruz for taking on such a massive cast/crew and coordinating them all seamlessly. It really takes a special person to unite such a large cast and spur them on toward greatness! I believe you will be blessed by this lovely ensemble, and encouraged by the timeless spirit of sacrifice and love that George Bailey embodies. The show begins with two angels, Jo (portrayed wonderfully by Sena Weaver) and Frankie (portrayed delightfully by Tori Minakowski), introducing Clarence (portrayed cleverly by Robert Sebo) to the life of George Bailey. I thought this was quite clever, as it gives the audience a purpose to hear George’s story from age 8 all the way through to that fateful night when everything fell apart. As George’s story plays out, we discover how much he sacrifices for his town and his family. But George meets his match when he has nothing left to sacrifice, and suddenly everything he has fought for is in jeopardy. What happens next may reduce you to tears. George Bailey is portrayed by three equally lovable gentlemen: Ilya Jonas (age 7-12), Cameron Walker (age 18-25), and Brian Davis (age40-50). I thought that all three of them did a wonderful job conveying the spirit of George Bailey. Of course, what would George Bailey be without his devoted and loving wife Mary Bailey, portrayed by three absolutely darling ladies: Sophia Tiberie (age 7-12), Ashley Vernier (age 18-24), and S. Leigh Deane (age 35-45). The pairing of these fantastic young actors/actresses were perfect! Among this impressive ensemble of characters, I must extend attention to a few who really stood out. Mr. Potter (portrayed with great grouchiness and evil by Jeff Larsen) was perfect in his villainous role. Bert (portrayed by EJ Roach), Ernie (portrayed by Aaliyah Roach), Annie (portrayed by Kate Acquah) and Violet Brick (age 18-30) (portrayed by Elizabeth Cullens) were wonderful in their roles. Each time they set foot on the stage they exuded confidence and wit, and were really captivating! Last, but certainly not least, I was really impressed with the stage presence and performance of Brooklyn Bricker, who portrayed Miss Davis. Truly, the entire cast was each given a chance to shine under the careful direction of Ms. Cruz. The stage crew also spent a fair amount of time on stage during the numerous set changes that transitioned the show through nearly 40 years of George’s life. I must congratulate the crew, led fearlessly by stage manager James Atwell and assistant stage manager Alex Griffin, for keeping all of those set changes straight. The costumes were well suited to the time period, and I adored the angel costumes. With a cast this large, costume designer Dawn Dennison certainly had her work cut out for her. Kudos to her, and her crew, for managing such a large and diverse set of costumes! The stage set was simple, but it served its purpose in taking us to Bedford Falls (and above it). The set team, led by Frank Antonio, did a great job building and painting the set. That being said, I must congratulate this cast and crew for really driving home the message of this show. I was in tears as the show came to a close due to the careful attention paid to the message of love and sacrifice that George Bailey gave and then received. It is very easy to lose the message of a show, and I was blessed to see even the youngest cast members embodying this important spirit and sharing such a beautiful moment with the audience. Thank you! If you are a lover of the classics or want to share a wonderful story with your family, come out and support Twin Beach Players as they perform “It’s a Wonderful Life.” I believe you will be blessed by this lovely ensemble, and encouraged by the timeless spirit of sacrifice and love that George Bailey embodies. His story tells us all just how valuable each and every one of us is to the world around us, and reminds us not to ignore the angels in our life (though they may not be as obvious as we hope). Running Time: 2.5hrs with a 15-minute intermission. Advisory: Smoking and drinking simulated on stage. A family-friendly show for all ages. “It’s a Wonderful Life” at Twin Beach Players will be playing through December 16, 2018. For more information or to purchase tickets, please click here.